Barefoot In Blue Jeans: My New Craft Project! 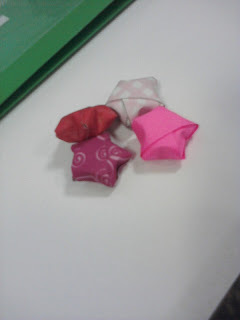 Origami Stars! Lucky Stars! This is my new craft project!! I'm so excited about it. I know it's something simple, but it's an easy craft project. I want to be a craftsy person, like major shopping trips to Craft Warehouse or stationary shops. I love making things, and it's fun to get all excited about something new. I love it! When I was little, I would make crafts all the time! It was a blast! My mom would get out the craft bin, and there would be paper; felt; glitter; beads; etc. I loved the craft bin. I also loved this little sand candle kit I got from school, I remember when I was like 4 or 5, and mom would put Brittney down for her nap, my mom would get down the sand candle kit and set it on the table, we would make our sand candles together. I loved those times, just mom and me. I also got a nail art kit that year for my birthday, again when my mom put Brittney down for her nap, it would be just 'mommy and me' time. The nail art included: nail stickers; nail polish; nail clippers; nail glitter; decals-stickers; rings; etc. Again, SO fun! I would always do a craft at a friend's house, or my Gma Biggs would take my sister and I to Craft Warehouse and we would pick out little wooden boxes, or beads and we would paint the boxes or make necklaces. So, I'm introducing a 'reformed' me! A more artsy/craftsy kind of Courtney. Of course I'm still going to write, writing is one my arts!